I will be very glad if you take the time to read my pages on sharpening. There are many under-pages with information. 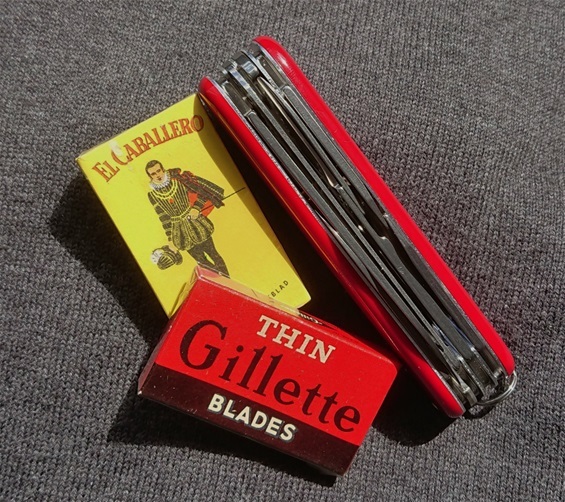 With practice you can achieve the same sharpness on your SAKs as a razor blade. It is about the pressure you use that can produce the fine edge. It is fully possible to do this by free hand. Fine surface diamond stones and ceramic stones can be used. If you take the time to polish the edge with a surface that is finer than or around 1000 grit you can make the edge compact and very fine. The result of this is that you make it less possible for rough areas that come off the steel during use. Much of this can damage the edge over time. If you run the fingernail along the edge you can feel that the edge will become very smooth almost like you run the nail over a very smooth surface. SAKs usually have delicate edges that require maintenance or sharpening to maintain the nice edge. Even with a polished edge you will have to maintain this on a regular basis. It helps for the nice comfortable precision cutting and over-all feel and functionality. It is also easier to clean with a polished edge. For some materials it helps with a more coarse edge as it will grab into some materials a bit better. On wood I feel the best performer is a polished edge. There is little point of using anything above 1000 grit if you use correct pressure. If you are looking for a general use edge then 600-800 grit diamond stones will do the trick for a very nice functionality. If you like to Leather Stop then I recommend making it yourself. Then you can experiment with blade sizes and different dimension on the strop. Glue some leather on a piece of wood and you have a very good device to use on the edges. Leather strop on traditional SAKs is not much point in doing usually. Today you can get several different compounds with coarse and fine ones. Leather is very effective without compound as well. SAKs are very nice tools to use when you make your own with wood and leather. There is little point in making them very nice looking because they are users. You can make the double with both sides of the wood part used. You can take advantage of both sides of the leather too. There are many interesting miniature knives made over the years. To be called a functional miniaturization it must have implements with a blade or functions that can be used. 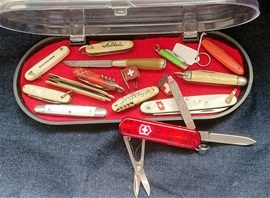 On the picture you see some miniature knives that I have collected just for fun and for the knife interest. I show them on the side with a 58mm Classic type with the SD tip on the file. It also got an LED light, scissors, knife blade and tweezers all in this little 58mm Classic Category. This model got the translucent scales in a SwissLite Rubin configuration. In other words it is a very useful model to have on a keychain for example. 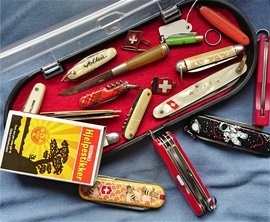 It is for me a miniaturization of the well-known Swiss knives. 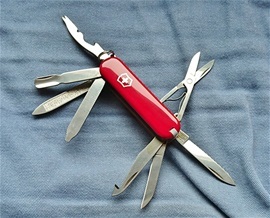 It is a Swiss knife and it is made by Victorinox. This category of knives fit very well into the EDC type of philosophy and very well in combination with larger pocket knives with more functions too. To make functional miniaturization is an art and to be able to fit the demands people have is there. There is a balance between how small and delicate a product can be before it no longer can have functionality that is comfortable enough for EDC. They are made to be used and they can be sharpened. The scissors are durable and the slim little blade can be used for the small things. It is easy to sharpen them when you need. This one is an unused knife. They are easy to sharpen with an abrasive that is extra fine. 800 grit diamond stones or ceramic stones can also be used. That is important because some would believe that such small knives are not designed to be used and that is not correct. For sure I prefer larger knives and SAKs but they are made for use over time and you can do regular maintenance on these just like the larger categories require. The 58mm Classic category can be used with good results for people. When it comes to the selection of miniature knives in the box it is a bit different. Some of them are made as souvenirs and fun knives that can be for a talk subject or memory. It is fun and it awakens the interest in knives. Some are just miniaturizations of larger knives and made to give an impression of such. The knife blades can be used and they can actually be sharpened. It speaks for itself that many are too small to have any functionality or have the comfortable use for people. The 58mm category made by Victorinox is probably the smallest pocket knives that is versatile that can be called functional miniaturization designed for use every day in the world. At least for me it is the icon of a versatile knife in a small package. The Classic line 58mm by Victorinox got several successful models that are made with functional miniaturization. One of them is the MiniChamp for example. The model I would like to show you today is within the Classic Limited 58mm. It is the Space Walk model that is from the 2017 limited selection. The number on this knife with the Classic SD functions is 0.6223.L1707. This does show a very fun design that independent people of the world helped to create. This design is intelligent, fun and interesting and it radiates impressions. It does show functional miniaturization and art at the same time. Knives like this become “talk subjects” and can help to give joy for the eye and joy for a cutting tool when you need it. Perhaps the screwdriver can be used in need as well. There are several more helpful features on this little 58mm package. 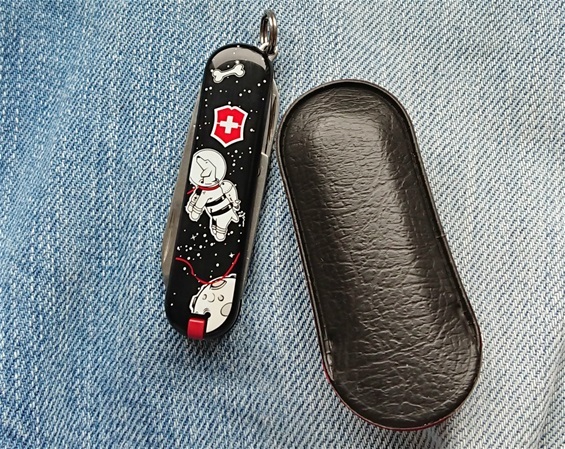 It also reminds me how Victorinox products and Swiss Army Knives have been used in space exploration and research. This is one of the really serious 58mm models with an incredible number of functions that are functional miniaturization in my opinion. On the pictures you see some functions but there are more functions like tweezers and pen + key ring on it. The model number on this is 0.6385 and it is one that I bought several years ago for my collection. I have had several Classics on my keyring over the years. They are durable and very useful to have. 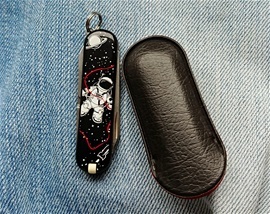 This model got all the aspects of what is functional, what is designed for use and very pocket friendly EDC. Over the years I have seen some discussions and forum talk about the MiniChamp models. This got everything in one miniature package before you go out. Remember that I am here if you got any input or questions. 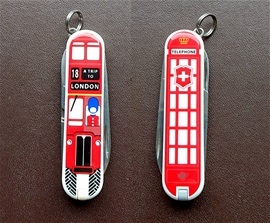 This is my latest Victorinox Classic from the 2018 selection of Limited knives called A Trip to London. No doubt that this knife got functional miniaturization. The decorative design is so well made that it tells a complete story on its own. It does show that art, decoration and designs does not Have to be so large to have much depth and information in them. Sharp and ready functions with a nice design make this the little extra.